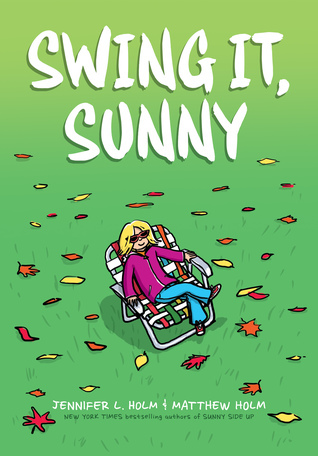 Sunny is back from her big Bicentennial summer grandfather's in Florida and trying to get back into the swing of life without her brother Dale. He is enrolled in a military school and very angry at their parents, so he won't even really talk to Sunny on the phone. Sunny hangs out with her friend watching t.v. after school, helps with her little brother, and wishes things were the way they had been before. She goes trick or treating as a nurse, and she and her friend later ambush neighborhood rowdies who have stolen someone's candy. Dale visits during Christmas but is very negative and isn't thrilled with her gift of a pet rock. As the year wears on, an older girl who is on the flag line moves in and teaches Sunny how to twirl flags. Dale starts to be more communicative, and Sunny's disposition improves a bit. Strengths: The details in the pictures and the size and length of the text is exactly what my students prefer, and the story of Sunny's brother's problems is done with a deft touch-- not too many details, and focused on how Sunny feels. The color scheme and the details of Sunny's house are EXACTLY correct. Aside from the fact that my parents had a 1960s television console in a different corner of the room, the family room looked exactly like the one I grew up in! Children really did watch a lot of Gilligan's Island and Brady Bunch after school, although I was never allowed to watch t.v. if I had friends over. Loved the grandfather. Great introduction to a time period with a story that is accessible to current 12 year olds! Weaknesses: I wished there had been a few more details about middle school and middle school culture in 1977. Maybe in the next book! In general, graphic novels leave me wanting a lot more information about what a character is doing and thinking. If this would have been a regular novel, I would have loved it more, but since the Holms do a perfectly formatted graphic novel for middle grade, my students won't feel this way. Could have used a little more information on the flags-- was it color guard? Flag line? My cousin was a majorette, but I didn't pay much attention other than watching the half time shows she was in. What I really think: Buying these in PermaBound or FollettBound format so that they last a bit longer. Ever since her mother's death, Kenzie has not had a permanent home. She travels from hotel to hotel with her father, an environmental consultant who home schools her and who has a roster of nannies in every town who can watch her when he is at work. 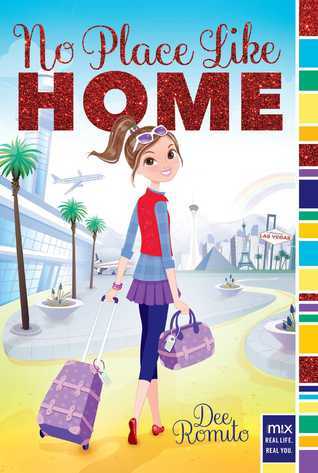 When He gets a posting to Las Vegas for six weeks, he enrolls Kenzie in middle school. She's apprehensive, but thrilled for the opportunity to be a "real" student once again. Even though she knows she will soon be leaving, she tries out for the lead in the play (Dorothy in the Wizard of Oz), irritating Shelby, who wants the role. She also runs for class president against the cute Tate, with her new friend Ashia as her vice president. Of course, she gets the part and a vice presidency, and also joins the book club. She still spends her weekends traveling with her dad, and makes a new friend in D.C., Mayleen. Eventually, she has to tell everyone that she is leaving, and no one is at all happy. The principal even tells her that she should do the open skate anymore, to give her classmates time to get over their trauma. Of course, after she tells everyone she's leaving, her dad lets her know more about his plans. Kenzie has to really think about what she really wants out of life-- more adventure, or a more stable home and school life. Strengths: Kenzie is an interesting character with a fascinating life, and it's intriguing that she is able to go so easily to the forefront of middle school society. My students love the Aladdin M!X books and would pick this up just for the cover. The writing is great, and the story has realistic middle grade emotions. The way that Kenzie deals with the absence of her mother is very well balanced, which is hard to find in middle grade books. What I really think: I will buy this one if I have money left over at the end of the year. Follettbound does NOT last when it comes to comics. Permabound, Bound-to-stay-bound or ChildrensPlus are much better bets. I don't like having more than two vendors so I use Bound-to-Stay-Bound first, then Follett for other stuff. I sometimes use Children's Plus for things I need well bound that BTSB or Follett don't have (or don't have bound the way I want). But that's rare because I don't have the time to worry about too many lists.